Call of the Stream | My blog is an ongoing celebration of my passion for all that embodies small stream fly fishing, incorporating my interests in photography, the outdoors and art. It was an eventful day during the 2017 Wild Trout Association’s Trout Festival. 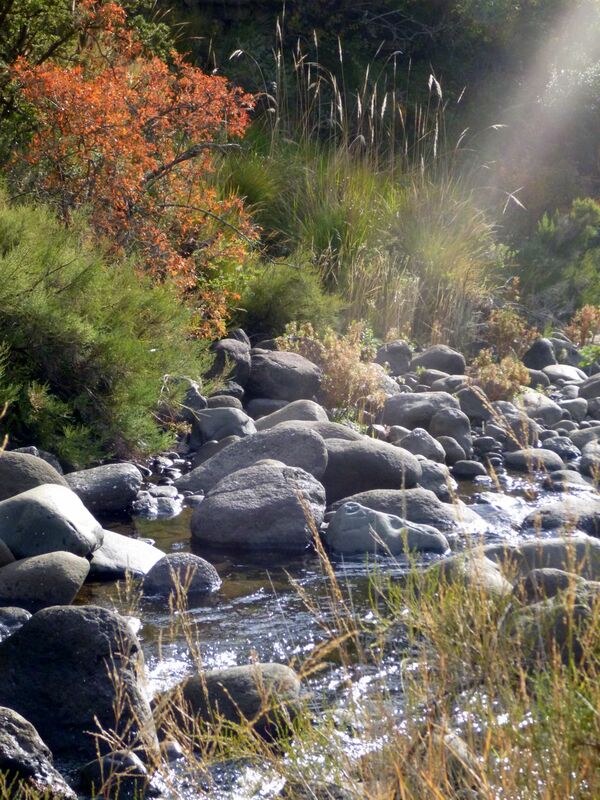 We had been allocated a beat on the Bokspruit, a beautiful stream, one of my favourites, a place where trout rise and there is a magic show of light and shadow. But it was on the dirt road a few kilometers from the village of Rhodes that things really began. The Doc, Andrew Mather and the Prof, Duncan Brown were deep in conversation. I was in bubble of my own thoughts, thinking about a line from a book I’d read recently. The author described his passion for small streams. He said something like, “all this mountain madness of mine. The endless pursuit of high-country trout and my courtship of solitude.” it resonated with me – the trout of yesteryear begin to rise again in the rush and tumble of the mountain streams in my imagination. BANG, my bubble burst. Doc slammed on the brakes and we skidded to a stop. What the……? “Roadkill”, said Doc. As the dust settled and my heart dropped back into its position, there, over the front of the bonnet of the Subaru lay the lifeless body of a scrub hare. No doubt a headlight blinded victim run over the night before, a not uncommon occurrence on the backroads in wild trout country. By the time we reached the old Bothwell farmhouse, the Prof and I were sure there was a faint whiff of early decay. “No problem, it will be fine”, says Doc and promptly hangs the packet and contents from a branch of a nearby tree out of reach of any potential scavengers. Tackled up we walked back along the road to the lower end of our beat. On the way I took them to see a cave I knew of with some Bushmen paintings. It was a scramble through a rusty barbed wire fence and up a slope that was more suited to mountain goats, but worth the effort. The North Eastern Cape region is rich in the rock art, cultural and spiritual heritage of the Bushmen. Before we reached the start of out beat where the road runs above and along the river, we spotted six or seven decent trout feeding actively where a spring fed seep flowed into the stream. We’d fish upstream to below this point and then either Doc or the Prof would have a go at them. Turns out when we got there, they decided for some inexplicable reason, that I should show them how it should be done – no pressure. Doc and the Prof sat down in the grass on the right bank, waited and watched. There was no cover from below the fish so I sneaked up the right bank to above the fish, crossed the stream to the left bank and used the shade of the willows to conceal my approach. Reaching what i thought a safe distance, I stripped line, made a short cast to get a feel for distance, picked up line for a single cast with enough slack to drift downstream over the fish. Out of my peripheral vision I spotted two figures peering through the grass with cell phone cameras pointed in my direction. The inevitable happened, with my casting inadequacies revealed, I brought the back cast forward too soon – the line, leader and fly landed in a heap out the tip of the rod, presumably perfectly captured for posterity. In that moment it felt like being dumped in the shore-break and pretending it was somehow, intentional. I chanced a smile in case the cameras were rolling, cast again, this time it worked and the dry drifted into the trout’s window of vision, a strike and a lively, acrobatic trout fought for freedom. I reeled in, waded back, made some weak excuse for the duffed cast and accepted the sympathetic words of encouragement from my esteemed companions – I managed to rescue some of my bruised ego. We moved on fishing upstream to a Poplar grove where some years ago I’d stalked unsuccessfully two decent sized rainbows, but not surprisingly they were no longer there. Doc and the Prof walked ahead to a couple of good runs above the Poplars. When I caught up to them, they were in anxious conversation in the middle of the stream, something was wrong. Turns out they were contemplating the removal of a barbed hook, deeply embedded in the Prof’s forearm. First, I needed a photograph. With the assurance that his wife would be able to repair his expensive fishing shirt, I cut the tippet and made a slit large enough for the fly to pass through his sleeve. A quick rearrangement of the hairs on his forearm and adjustment of the angle for the best lighting, I got the shot. Photoshoot over, I explained to the Prof in my finest bedside manner that I was experienced in ripping barbed hooks out of body parts using a short length of mono. He didn’t look convinced, turned a little pale, gave his permission, eyes wide-open although I think, he may have been in prayer – in a split second, a quick jerk and the hook was out. As I recall the Prof thanked me, retied the fly onto the tippet, cast and promptly hooked a spirited little trout. Back at the car we had something eat, packed away our tackle, untied the Checkers packet from its lofty perch and tossed it into the boot once again. The hare was decidedly a little riper than earlier in the day – we drove back to Rhodes with the windows open. It had been a day to remember with a rigor mortised scrub hare and two of the finest companions. PS. The hare was frozen solid over the next couple of days in the deep freeze in our Rhodes cottage. It travelled all the way back to Durban on top of the luggage in the boot of the Subaru, feet still protruding from the Checkers packet – fortunately no road block explanations were needed. However, the fur of the well-travelled scrub-hare, never made it onto a GRHE. Doc’s wife insisted on its removal from amongst the frozen foodstuff in their home deep freeze – makes sense. Thanks Andrew and Duncan for a day to remember. Sadly, I can’t say the same for the unfortunate hare. The truth of it is I’m a soppy, sentimental, self-confessed nostalgic, a trait inherited from my father. My wife Colleen and I recently did a road trip through the Transkei and Eastern Cape visiting old haunts from our youth and later after we were married, that held so many good memories for us. A particular highlight for me was revisiting Maden Dam at Pirie, a short drive from King William’s Town. In the 1970’s as a member of the then Frontier Acclimatisation Society I fished Maden Dam frequently. But, it was especially the forested headwaters of the Buffalo River that held the attraction. It was here where the stream flows into the top end of the dam that I caught, with the help of my mentor, my first trout in 1955 – a small 12 inch rainbow on a Red Tailed Invicta. How do I know this? – apart from the memory I have of that exciting moment, I found an entry in my Dad’s diary where he recorded that special event. From the spot known as Pages Corner at the top end of the Dam, I scrambled a few hundred meters upstream into the indigenous forest, searching for that magical pool. I found it eventually, recognising the large rock against the right bank where the small trout was fooled by my offering. There was a strong flow that day, 64 years ago, with a lively cascade at the head of the pool, unlike the very low water level on the day of my visit. Amazingly, very little seemed to have changed as I remembered it. Going through my Dad’s stuff after he passed away in 1978, I discovered a box of family keepsakes each that held a special meaning for him. Amongst these was the not so little Red Tailed Invicta from that eventful day on the 5th April 1955 – he had saved it. Colours have faded over time like the handwritten pencil note that described what it was. The fire that ignited my fly fishing passion all those years ago, still burns as brightly now as it did then. Weather predictions were against us trekking into the mountains. Instead we opted for the lower reaches of the river in the tribal lands. While not as many as others I know, I do have a few notches in the cork for some decent river fish, but I don’t hunt for them specifically. My interests draw me rather to the higher reaches, those pristine streams in wild placees. The rivers that flow through the tribal lands are far from pristine, impacted by human activities, erosion, litter and use of its waters for some of the rural communities daily chores. Despite this, these water are known for holding larger fish. We parked above the causeway at the spot that is used by local taxi drivers for washing their vehicles when business is slow. We were almost immediately surrounded by a small group of youngsters interested in our activities as we strung our rods and tackled up. A final request for ‘sweeets’ and with nothing forthcoming, they returned to swimming in the bridge pool that they shared with a group of women busy with their daily washing chores – blankets draped over sun drenched boulders and a colourful mix of clothing hung out to dry along the barbed wire fence. We walked downstream towards the confluence with a small tributary that we were keen to explore. About 400m from the causeway, Piet spotted a pod of decent scallies in a deeper pool and decided to have a go, Mark stayed with him and Colin and I walked a little further downstream. Waiting for Piet and Mark to catch up we stood at the edge of a promising looking run. Midstream, there was a large boulder just subsurface, the main current rushed past on the opposite side and through a deep slot. I decided to make a cast, nothing fancy just really to pass some time. I dropped the bushy RAB into the main current a meter or two upstream of the boulder. It raced downstream towards the tail of the run, nothing. My second cast was the same. As it passed the boulder a large buttery spotted shape rose out of the slot and turned under the fly, Colin swore, “what the f#*k”, my heart pounded in my chest. “Did you see the size of that thing?” he asked. How could I miss it. I cast again. This time the big brown rose and engulfed the RAB, turned and porpoised showing the full breadth of its shoulders and large dorsal fin. It was big, very big certainly the biggest wild river trout I’d ever had on the end of my line. I felt the weight and let it swim down while keeping minimal tension to protect the fine 6X tippet, fighting the urge to rush it. Back in its holding lie, it was solid. I wondered if it even knew it was hooked. I had to get it to move into open water. Increasing the pressure the brown must have felt the steely prick, then the thump, thump as the head bashing started, typical of big browns. I was never in control, I increased pressure and then, that sinking feeling as the bend in the rod straightened, the line went limp and drifted on the current – the big brown and the RAB were gone. I was thankful that Colin was able to validate the story otherwise it may have joined the ranks of just another fishy tale. We went back to the spot the next day and tried a variety of dries and weighted nymphs, nothing. A wise old brown – once pricked twice shy. I have been fishing the small streams of the Drakensberg for what seems like forever. I have clocked more than half a century and some serious miles here. But as far as the streams and the environment are concerned, it is no more than blink in time. I still like to fish the waters I have fished more days than I can recall, water that I share a history with. Despite the time that has passed, even today, the same patterns repeat themselves almost every time I go fishing; although the sensations are now more and broader, marvelously more complex, even bewildering at times, and almost always related to other factors – the seasons, the rain, the wind, the sun and the mood of the trout. Trout are forever associated in my mind with thankfulness, reminding me of beauty and a sense of possibility. The fish rise, the rings spread, they make a splashing crown of water with flashes of silver, gold and red – for a moment, everything stops. The weather turned foul and there was little prospect for fishing. We passed most of the day and evening in a deep valley below the towering escarpment, hunkered around the fire in conversation and drinking copious amounts of coffee. A sense of connection crept into my awareness and a realisation that exploring our place in the wilderness is an extremely powerful and essential human instinct. Unlike the complexities of living in the city, to survive in these wild places daily routines take on a simplicity of basic needs; finding shelter from the elements, collecting water and wood, food preparation. It is in all of us, a fundamental relationship with the natural world. Nine a.m. – it’s already 25*C outside and predicted to reach 31*C by 2 p.m. An hour up the road it’ll reach 36*C or thereabouts and we are still in spring mode, summer could be hell. The beginning of this season had all the right signs for a better one than the previous 5 or 6. The rivers and streams were flowing better than was expected in early spring. But, since then there has been nothing but some patchy rainfall, very little in the catchments where it counts. The forecasted heavy snowfall in September was a damp squib. I have fished a few times this season, but have despite the urge to get out there, decided to wait now until, hopefully, the weather gods will relent and bring the much needed rain. For now the rivers and streams are desperate for a good flush to clear the winter build up of algae and slime. I may be opening the proverbial can of worms, but it’s my view that it is unfair to add to the trout’s stress in the poor conditions by fishing for them at the moment – low, warm water, depleted oxygen, little or no natural aeration. I can wait and the fish aren’t going anywhere soon. My thoughts turned to the weather and the seasons and how much their changing patterns affect all things, not the least of which, our fishing lives. I recall walking upstream earlier this year on one of those mornings when the rising sun cast a golden light over the high peaks. The landscape was already dressed in the warm hues of autumn, out in the west the sky was inky black – a cold front was coming in. Soon the old browns would be in the last sideways shuffles over the redds in the thin, clear waters, cold from winters snow. And, as I always remembered it, with lengthening daylight, the first rains of spring would come, bringing freshness to the landscape, the smell of damp earth and the celebration of new life bursting everywhere. Then, almost imperceptibly spring would always slide into the dog days of summer, wide blue skies, soaring temperatures and the atmospheric crack and spit of storms rumbling across the land like some meteorological indigestion building up for a great event – before softening once again into that magical time, the sweet of the year, autumn. These changing cycles are part of the greater pattern – the rhythms of life, a fishing life. Knowledge involves understanding, comprehension, and mastery. It’s about acquiring, sustaining, growing, sharing, and applying information. If learning is the recipe, then knowledge is the cake—the way to build expertise. Fly fishing is just one small slice of the cake. It can other than the obvious benefits for the fishing, contribute significantly to our lives generally – patience, observation, understanding, appreciation, respect, inspiration, creativity and so much more. In my case I have found that fishing small streams there is always an insatiable hunger for more knowledge. It leads to a better understanding and skill from the early fumbling attempts at casting and presentation to fooling even the most difficult of trout. How many, even apparently insignificant questions, but telling ones, have led from then to now – and, what a fun journey it has been, a logical, natural progression from not knowing to knowing. But, it doesn’t end there and part of growth is learning how to learn – to assimilate, to modify and to adapt – it is a never-ending process. MOUNTAINS, STREAMS AND THE BIG BROWN. La Nina, Family and Fish. Crocheting for the love of it!